All of a sudden, Earth's peace was being threatened. The evil conquerer, Frieza, had suddenly appeared on Earth. His ambition - to obtain immortality by gathering all the Dragon Balls, and destroy Earth. To help Gokou get his powers back, you need to gather all the Dragon Balls before Frieza! 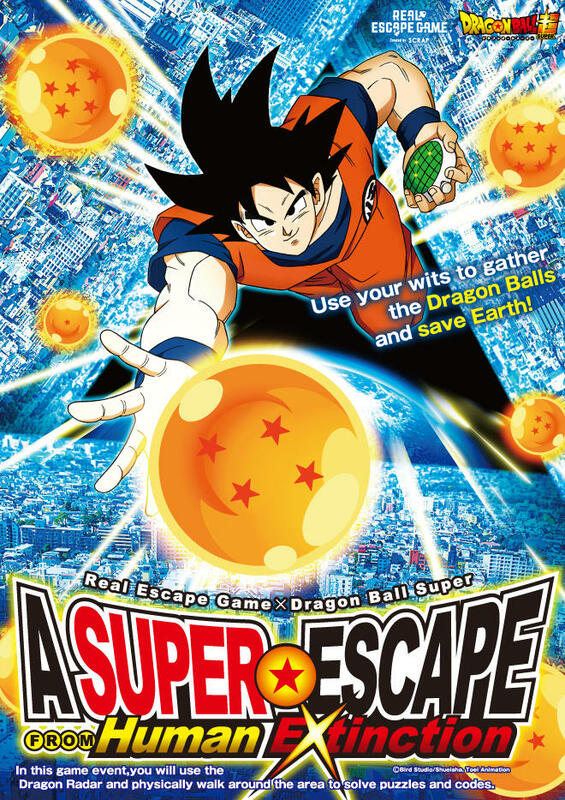 Journey with Gokou through this town where the Dragon Balls have been scattered, and help bring peace back to Earth! Any number of players can join! Currently, English game tickets are only available as 'on-the-day tickets'. Please buy your tickets at the counter! A special ticket that entitles you to one game kit for "Real Escape Game: A Super Escape from Human Extinction" and also a "Super Sacoche Bag". Q: Will I be able to enjoy the game even if I don't know anything about Dragon Ball? A: Of course! You will be able to enjoy the puzzles even if you don't know the story well. Players who know the Dragon Ball series will be able to appreciate the story better. A: No, there isn't! Children will be able to enjoy the game as well. The difficulty level is set for children age 10 and above. Q: If I'm playing in a group, do I need to buy game kits for everyone in the group? A: For everyone to fully enjoy the game, please get a game kit for everyone in your group. Q: Can I get another game kit if I lose mine? A: Sorry, but we cannot give you another game kit if you lose one. Please buy another game kit. Q: Are there any cases where the game is cancelled? A: The game will be cancelled if there is a storm or severe weather conditions. To get a refund for your tickets, please check the official website's NEWS section at that time for the announcement. Please note that if the game is cancelled due to severe weather conditions, we are unable to take responsibility for your transportation fee to the venue. Q: Can I play it over a few days? A: Yes, you can continue playing anytime during the event period. Please use the same game kit you were using previously. Your game progress will be saved where you stopped, so you can continue from the same point on another day.